Where did your ticket go? Just kidding! 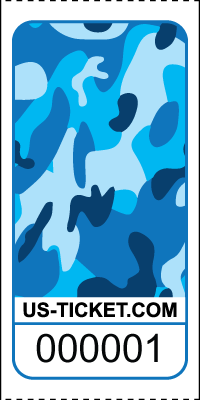 Our beautiful Camouflage pattern tickets are good for generic use for raffles, events, fundraisers, parties, and more! Our fun Premium Camouflage Pattern Roll Tickets are printed in bright colors on white paper stock with sequential numbering inside each roll. Available in 8 vibrant colors. Call or e-mail a customer service representative to customize a ticket for YOUR event today!